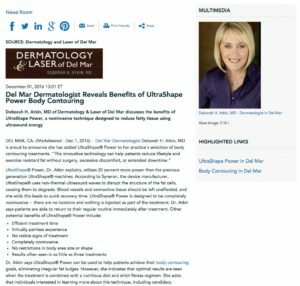 Deborah H. Atkin, MD of Dermatology & Laser of Del Mar discusses the benefits of UltraShape® Power, a noninvasive technique designed to reduce fatty tissue using ultrasound energy. Dr. Atkin says UltraShape® Power can be used to help patients achieve their body contouring goals, eliminating irregular fat bulges. However, she indicates that optimal results are seen when the treatment is combined with a nutritious diet and strict fitness regimen. She adds that individuals interested in learning more about this technique, including candidacy requirements, should speak with an experienced medical professional who utilizes this technology. 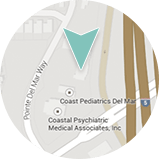 Founder of Dermatology & Laser of Del Mar, Dr. Deborah Atkin is a board certified dermatologist who practices in the San Diego and Del Mar area. She earned her medical degree from the University of California, Los Angeles School of Medicine, and she completed additional medical training at the Scripps Clinic and Research Foundation and the University of Arizona. Dr. Atkin has contributed to numerous community outreach programs and medical missions in the US and around the world. She is a member of several esteemed medical organizations, including the American Academy of Dermatology, the American Society for Laser Medicine and Surgery, and the American Society for Dermatologic Surgery. She is available for interview upon request. For more information about Dr. Atkin and her practice, please visit dermdelmar.com and facebook.com/dermdelmar.